Toshiba has met a deadline to report its long-awaited earnings results, reducing the risk that the firm will be delisted from the Tokyo Stock Exchange. The embattled electronics firm posted a loss of $8.8bn (£6.7bn) for the last fiscal year. Auditor PricewaterhouseCoopers Aarata gave a "qualified opinion" on the financial statements, meaning it broadly endorsed the results. Toshiba has struggled to recover from a 2015 accounting scandal. The firm's troubles started in 2015 when it was found to have inflated the previous seven years' profits by $1.2bn. The accounting scandal led to the resignation of several members of the firm's senior management, including the chief executive. In late 2016, billions of dollars in losses at its US nuclear unit Westinghouse were first revealed. Toshiba, looking to diversify away from consumer electronics, had bought the business in 2006. Its financial troubles deepened after delays and costs overruns at two US reactors, and as global appetite for nuclear energy waned following the 2011 Fukushima disaster in Japan. Westinghouse was put into Chapter 11 bankruptcy, which protects it from creditors while it undergoes restructuring. What have the auditors said? Toshiba had delayed the release of its financial results for months, as it struggled to secure sign-off from its auditors. PricewaterhouseCoopers Aarata on Thursday delivered a "qualified opinion" on the earnings for the year to March, as well as the April-June quarter. That means it broadly vouched for its accounting despite finding minor problems. So it won't be delisted? The auditor's sign-off reduces the immediate threat of Toshiba being delisted from the Tokyo Stock Exchange. The company was demoted from the first tier of the exchange in June after confirming its liabilities outweighed its assets. If Toshiba reports negative net worth - liabilities exceeding assets - for a second consecutive year it would likely prompt a delisting. It's up to the Tokyo Stock Exchange to decide whether it can remain on the bourse. Toshiba has narrowly escaped de-listing - for now at least. But the troubled firm's problems are far from over. While auditors PricewaterhouseCoopers Aarata have broadly endorsed the results, there are reports that PwC also issued an "adverse opinion" on Toshiba saying the company didn't do enough to alert investors about the losses at its US Westinghouse unit soon enough. Toshiba says that it reported the losses as soon as it could. But the risk hasn't gone away. Another deadline still looms - the company has until March 2018 to resolve its debt issues. Analysts say it's hard to see how the beleaguered electronics giant won't face delisting soon - simply because trust in the firm's ability to resurrect itself is at an all time-low and the company hasn't done much to infuse investors with confidence. The company needs to sell its prized chip business to cover its hefty US losses. But the sale has hit hurdles. 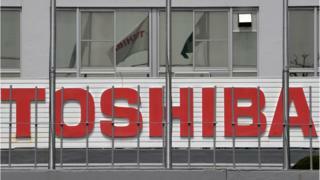 Toshiba is trying to offload the unit to a consortium of US, South Korean and Japanese investors. The sale has been challenged by Toshiba's partner and rival bidder, Western Digital, in court. Toshiba is the world's second-largest chip manufacturer. Its products are used in data centres and consumer goods worldwide, including iPhones and iPads.